posted by Jessica on June 28th, 2012 | The Winning Story from the MFX June Storytelling Contest! The question I’m most often asked about my hometown is ‘What’s in the water in Waterloo Region?’ This frequently posed query is an outsider’s way of trying to figure out what makes us tick, what makes Waterloo Region’s economy weather turbulent times better than most, what makes innovative institutions seek residency here; in short, what makes us so darn special? Fortunately, I’ve been able to arrive at an answer. It’s the people IN that water that make us so special. There’s just something about the folks in this community. I can’t imagine a place where you’d so readily find a helping hand, an attentive ear, or a sturdy shoulder…all at the other end of a quick phone call or – around here – more likely an e-mail sent on your BlackBerry Bold. Yup, it’s the people that make us special, all right. Nowhere was this more evident to me than on the night of April 4th, 2009. That was the night of the 22nd annual Mayors’ Dinner, a yearly event in support of The Working Centre. Established in 1982, The Working Centre was created as a response to unemployment and poverty in downtown Kitchener. Its founders, Joe and Stephanie Mancini, are as much a part of the fabric of this community as King Street itself. Each year, the Mayors’ Dinner recognizes a person or persons who have made a meaningful contribution to our community. It’s also an integral fundraiser that enables The Working Centre to continue its important work. The guests of honour at the Mayors’ Dinner three years ago were John and Donna Weber. Their contributions to amateur sports and their generally selfless nature made them easy selections as honourees. But in keeping with the spirit of this story, what made this night memorable for me was not so much what John and Donna had done but rather how those in the room rallied around the Weber’s generosity. To understand this story is to understand a little bit about Donna Weber. To put it mildly, if you were ever fed by Donna, you’d remember the meal or the baked treat for the rest of your life. As a couple, John and Donna would open their home as billets to Kitchener Rangers hockey players. Before long, the Weber household would become the gathering spot for the players because there was always an ample supply of delicious food. No challenge was too great for Donna, who would prepare food for major sporting events our community was able to attract. Those events included the World Women’s Hockey Championships and the World Fastball Championships. Her decision to stray from “traditional ballpark food” at this latter event led to the sale of 6000 slices of pie and food revenues that out-paced even the sales at the beer tent. Donna sure did leave a mark in the kitchen. So I guess it comes as little surprise what happened at that Mayors’ Dinner in 2009. The fundraising portion of the evening included the usual silent auction items along with a handful that were auctioned live. One of those live auction items was a dinner for two, lovingly prepared by Donna herself and served up in the Weber home. While admittedly impressed with some of the dollar figures that had been bid already that evening, nothing could have prepared me for what turned out to be the ultimate prize. Before I could bat an eye, the bidding for Donna’s dinner for two reached $1000. With two tables aggressively bidding back and forth, the dollar amounts increased rapidly. It wasn’t long before a winning bid of $1500 was announced. Donna’s culinary reputation was that good. The simple offer of a homemade meal for two was enough to generate $1500 for The Working Centre. And then, as it turns out, even more. The second table that had been in the bidding asked if they, too, could donate $1500 and also take part in a dinner with the Webers. With a laugh, Donna agreed. But we weren’t done there. It seemed the crowd realized that $1500 to share dinner with the Webers was great value for the money, so a third table chimed in. They, too, would like to take advantage of this incredible opportunity. Again, Donna laughingly agreed. And that’s how it came to be that Donna Weber prepared a meal for six guests…and raised $4500 for The Working Centre. Of all the art, sporting events and wine tours up for auction that night, it was dinner with John and Donna that opened the wallets the widest. To be sure, Donna’s food alone would be worth every penny. But what this really was – more than anything else – was a response to John and Donna as people. “My heart steers me towards hospitality,” Donna once said. “Everybody eats.” For John, he remembered well the lessons he learned at Bluffton College in Ohio. Among them, “contribute time and money to church and community.” John and Donna practiced what they preached and the people of Waterloo Region were more than happy to embrace the message. Donna has since left us but her legacy lives on. “Donna’s Kids” is a program established after her passing in 2010. The goal is simple: to allow every child to play. Donna’s Kids assists parents with the costs associated with having their children play minor hockey. The program carries on the work Donna had done for 35 years through the Kitchener Minor Hockey Association. I have no doubt it will carry on for 35 more. So the next time someone asks you ‘what’s in the water’ in Waterloo Region, tell ‘em it’s people. Lots of them! But there’s no danger of drowning. Heck, even if there were, somebody would be nearby with a life preserver, reaching out with that helping hand. Comments Off on The Winning Story from the MFX June Storytelling Contest! Category: Communication Design, Community Design | Comments Off on The Winning Story from the MFX June Storytelling Contest! Over breakfast we talked with the company’s Head of Facilities, a 30-year Herman Miller veteran who is following in his father’s footsteps, also a 30-year veteran and facilities manager at Herman Miller. He played a role in a famous Herman Miller story that speaks to the culture of the company and gets to the heart of their reason-for-being. When they were building their newest production facility in a meadow just outside Holland MI, one of the challenges they faced was an infestation of wasps. The first reaction was to destroy the nests… but somehow, that just didn’t seem right to the Herman Miller building team. Was there a better way? In studying the situation, they learned that bees are natural enemies of wasps. So, they arranged for a bee-keeper to establish hives on the property. Now there are no more wasps, just colonies of busy, less aggressive bees! That’s not the end of the story. Today, visitors to the plant are presented with the results of this win/win solution: a small jar of honey from the Herman Miller bees! Breakfast over; it’s back on the bus and a brief trip over to the production plant mentioned above. We saw the hives on our way to the plant amongst groves of fruit trees. Like so much of what we have seen so far, the plant is very unique in layout. The meet and greet area is as nice as any home you would enjoy visiting, only bigger. Welcome, orientation and more delicious coffee in a seating area of plush couches, book-shelves and an entertainment centre. It could be your family’s favourite place to hang out. They call this manufacturing facility The GreenHouse, and rightly so, since it makes the best possible use of available daylight; even the production areas have huge skylights. Plants and even small trees are a feature of the corridors and meeting areas. The production manager explained how Herman Miller consulted with the most progressive manufacturers to develop production lines that were both people-friendly and productive. On the line we toured, dedicated to one chair design, a finished product left the line assembled and packaged for shipping every 17 seconds. Another highlight of our second day was a discussion with the company’s people responsible for performance environments and workplace knowledge. They are responsible for the research that leads Herman Miller’s customer services, focused on optimizing client spaces and maximizing their appeal for employees. We learned a great deal about what offices of the future may look like and trends in the industry. Then it was lunch in the meeting area prepared in the plant’s kitchen. Again, delicious. As dessert was served, we were asked individually to comment on what we had seen and offer ideas about how we could continue to interact together in the future. Some very provocative ideas were shared and I suspect we will be hearing more from these very clever, helpful and friendly, design-driven people. As impressive as their products and facilities are, Herman Miller people are the jewels of the organization; we spent significant amounts of time with a very diverse group: from design, to facilities management, research, finance, production line leaders and operations staff. While they all had their own way of expressing their activities, objectives and contributions to the organization, the overall continuity in what we heard is my most lasting take away. Everyone was so passionate about what they did and so proud of their company- singing from the same song sheet. All of us on the trip home agreed that this was one of the most enlightening business tours we have ever been on. In fact, we could only think of one thing to complain about; our bus driver missed the parking entrance to the duty free shop on the way back over the boarder. I have been a fan of the furniture design and manufacturing company Herman Miller since my college days at OCA (now OCAD), where I studied Industrial Design. Rebecca used to call on Herman Miller when she managed the marketing for engineered plastics at Geon Vinyl (they were one of her customers). She was always coming home with glowing reports of her visits there and just how progressive she found the people. With this background, you can appreciate how thrilled Rebecca and I were to be invited to visit the headquarters of Herman Miller May 31/June 1. Organized jointly by Herman Miller and their distributor, Prestige Business Interiors of Waterloo, on Thursday the 31st, we joined 12 other local design, facility and community oriented folks at 6:30 am for a 6 hour chartered bus ride to Holland, Michigan and Herman Miller’s Design Centre. On arrival, the first order of business was café lattes all around at the company’s coffee bar (as good as you’ll get anywhere). Then we were given a brief tour. We stood around the kitchen area during a visit with the President of the company. Then, we had an orientation in a living-room-like setting. This was followed by lunch in their meeting room, a delicious meal prepared in their own kitchens. The overall impression throughout the afternoon was that you were very welcome and special guests in someone’s home. We toured the office area next and experienced a very open and casual working environment with lots of natural light from windows and numerous skylights. Little meeting areas and nooks are found everywhere. The coffee/lunch bar stands in the middle of the office with no walls around it; this creates lots of occasions to interact and run into people. The last tour of the day was to the furniture design lab where we experienced a glimpse into the future of office environments. As the head of design, development and research explained, since people are now able to work virtually anywhere, successful office environments of the future will need to be more inviting and enjoyable; that’s the focus of Herman Miller’s designers. I was particularly impressed at the designers’ efforts to create furniture that minimizes environmental impact in manufacture and at end-of-life recycling. For example, I’m not allowed to tell you how many dollars they have spent to create a comfortable yet environmentally friendly chair back- just one component! We could happily retire on the money they have spent on just the effort to make this back more easily recyclable. Our evening was spent being wined and dined at Herman Miller’s own spectacular Marigold Lodge that will accommodate 30+ people in sumptuous comfort, right on the shores of Lake Michigan. No complaints here. 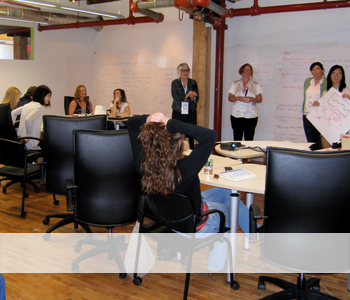 posted by Jessica on June 15th, 2012 | What a Workshop! Whiteboards at the ready; projector positioned to go; Post-It notes begging to be used. But why? And what brought 20 imaginative and brilliant minds together on June 18, 2012 to share, collaborate and contribute? Yesterday, we had the privilege to host the TEDxWaterloo workshop on Turning Ideas Worth Spreading into Actions Worth Doing. The workshop focused around taking the inspiration that many felt at TEDxWaterloo event held earlier this year at The Centre In The Square and using it to better our community. 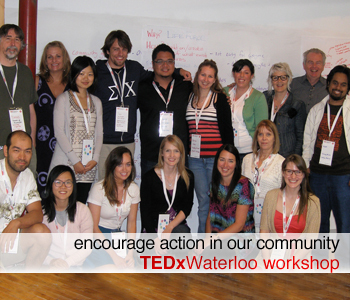 One of TEDxWaterloo’s original organizers, Renjie Butalid, ran the half-day workshop to encourage action in our community. We started with a volleyball and three rules. That is all that we are going to say about that. If this intrigues you, check out the next workshop to find out more. Whiteboards were filled by mid-morning with amazing ideas that were discussed and voted on for going forward. In the afternoon, everyone divided into four groups and worked on developing one of the four most voted on initiatives: community gardens in schools, a Waterloo Region startup festival, building community with the KwartzLab Makerspace, and sustaining the inspiration. The groups followed a seven-step process for how to turn inspiration into action. They separated into break out rooms where they used whiteboards and brainstorming to put together concepts and thoughts. We were especially impressed by the energy and enthusiasm that everyone showed when presenting their project and plans on how to further it. We are looking forward to following up on the progress of these projects and to more workshops in the future! Comments Off on What a Workshop! Category: Community Design | Comments Off on What a Workshop!